Microsoft just announced that it has sold 150 million copies of Windows 7, and that the OS is selling at a pace of seven per second. Not bad for an OS that was launched just eight months ago. At that pace, Windows 7 will rapidly be gaining market share. So how is it doing compared to its older siblings, Windows Vista and Windows XP? 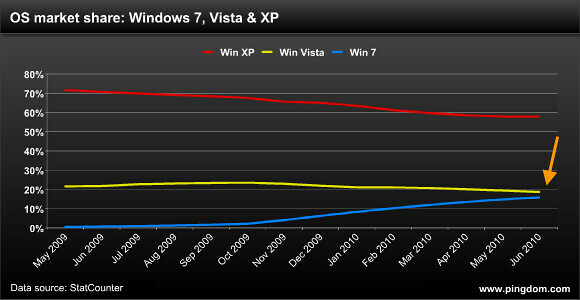 Windows 7 looks set to overtake Vista within one or at the most two months. Windows XP is still king of the hill with a dominating 58% share of the OS market. So, Windows 7 will have overtaken Vista after being on the market for less than a year, which is impressive, but it will clearly take much longer before it replaces Windows XP as the dominant version of Windows. Keep in mind that Windows XP is already ancient; it was launched in October 2001 and apparently still refuses to let go. Data source: The OS market share numbers come from StatCounter and are based on visitor stats from more than three million websites. When Seven was launched, XP begun to drop more quick than before. The people was waiting very much this Operating System and with the version who embed XP was more friendly for the companies. It go to be interesting to check how go to be the graphic in few month with the stop of the help for XP very soon. A new step for the new OS. Yes i agree with this aspect, because windows 7 has more new features that force to us drop older version of windows. People like me who have older computers have no reason to change because what we have works. If it isn’t broken . . . Maybe this explains why I drive an older but paid for car too.